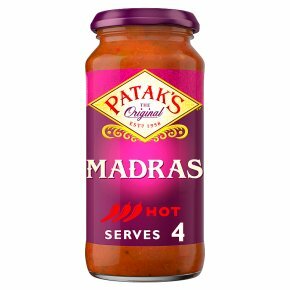 Madras Sauce. A tomato based sauce with chilli and cumin. Chilli rating - hot - 3. Gluten free. No artificial preservatives, colours or flavours. Vegetarian. A spicy tomato & onion sauce with crushed red chilli & cumin Our mouth-watering Madras Sauce is a wonderful blend of tomatoes, onions, chillies & cumin to create a delicious spicy sauce. A feast for the senses every time. How To Cook A Delicious Yet Easy Beef Madras - Serves 4: 1. Stir fry 440g of beef strips in a little oil until sealed (5 mins). 2. Add the sauce and simmer until the meat is cooked (15 mins). Enjoy with rice or savour those last mouthfuls with our delicious naan breads.